Ever hear of AppSumo? It’s a B2B online marketplace for products and tools to help you grow your business. In 2018, B2B online commerce in America was set to hit $9 trillion. And by 2021, it’s expected to reach over $1 trillion. Clearly, there’s traction in B2B commerce – and we’ll show how you can capitalize on AppSumo as a seller AND a buyer. Maybe you heard of AppSumo among a group of marketers or business owners you know. It’s a platform many businesses are taking advantage of to boost their sales (and save money). In a nutshell, AppSumo caters to the B2B market by offering great deals on services and products to business owners. And it helps businesses that sell these products and services connect with its 800K+ user base. By having your product or service featured on AppSumo, your deal will be sent to its massive email list. Then for two weeks, you can sell discounted versions of your product or service. You can set a limit to how many discounted products/services you have available. Many brands have had success selling hundreds of thousands of dollars worth of goods. And in some cases, they sell out in less than 2 weeks. 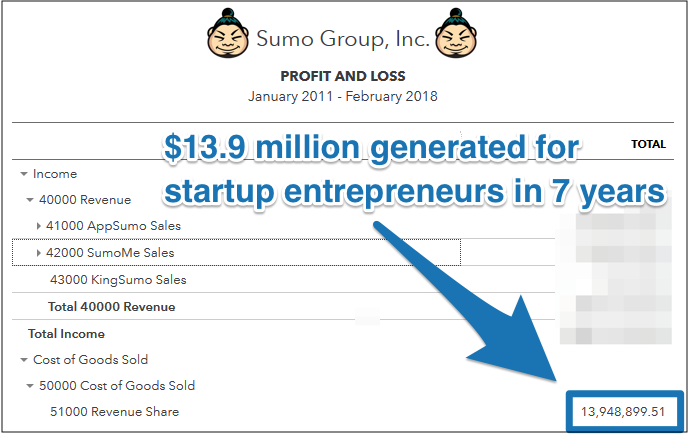 As of Feb 2018, AppSumo has helped businesses rake in an astounding $13.9 million (since its launch in 2010). *Shout-out: They actually released a great ebook on how AppSumo became a multi-million dollar powerhouse. What makes this app marketplace so successful is how it delivers value to its subscribers. By using AppSumo, you get a whole marketing team that can sell a boatload of products/services in a short period of time. It’s a great way to build capital and a customer base (if you’re a startup) or reach a broader market (if you’re a marketer). *NOTE: In exchange for everything they do for you, AppSumo does take a percentage of your sales. On the other end of the spectrum, brands get free access to crazy deals on really cool products that can help their business grow. Brands are able to find high-value products and marketing tools that they can use daily to help improve and grow their business. These deals are regularly emailed to them, ensuring they stay abreast of the latest products and services that relate to their business needs. The idea of giving away your products or services at deep 50% or higher discounts doesn’t sound like a good business move. Say you’re a business in its first or second year. You have a finance software application offered at a monthly rate. And while you have steady customers, you aren’t seeing the growth you expected to see by this point. Your marketing results are hitting a ceiling and aren’t generating enough buzz. You reach out to AppSumo and end up getting your product featured at an 80% discount. Since the target audience of AppSumo is startups and tech companies, you find that many of their 800K+ subscribers are ready and willing to pay for your service! Your deal is emailed to their subscriber list monthly, which can rake in sales for your business throughout the year. And although many of the deals are “lifetime”, you can always upsell your new customer base. What’s clever about AppSumo isn’t just the high sales potential, it’s that it allows you to spread your brand’s visibility and generate buzz fairly quickly. Lemlist: Generated 3,304 new users and $161,896 in 2 weeks. ^And this is just a few of the most successful listings. When done right – your brand awareness, traffic, and customer acquisition can be supercharged for months. Now, there’s an application process you must go through in order to get your product or service listed in their marketplace. But your aim should be to get featured. This is exactly what the aforementioned brands did and you see how well it worked for them! After you fill out your application, you’ll go through a negotiation process with AppSumo. This is when you have to convince them that your product/service is not just worthy of their marketplace, but being featured. Be open, honest, and flexible during your negotiation to get the best possible outcome. From new tool discovery and accessing great products for cheap, to being featured and leveraging their userbase to drive brand awareness, customer growth, user feedback, etc… AppSumo is both a channel and a resource to consider in your growth/marketing efforts. Not sure what tools would be most impactful for your business? Saphia Lanier is a professional blogger and copywriter with over 12 years under her belt. She has a deep interest in everything to do with digital marketing, small business, and health. When she’s not hammering away at her keyboard and nailing projects, she’s enjoying time with family and learning new vegan recipes.